Creagan Cottage is located on the A858 - main road from Stornoway to Callanish. It is a comfortable, modern cottage, equipped for your comfort. Creagan Cottage is an ideal holiday base being centrally situated on the island making the rest of the island easily accessible. The area boasts spectacular sceneries, lochs, mountains & beaches, ideal for walking, bird watching, fishing & surfing. In the centre of Lewis are some prehistoric and iron age sites, the most stunning of these being the Standing Stones at Callanish. The Callanish Visitor Centre provides valuable insights into the history of the Stones along with providing food and refreshments. Bicycle and kayak hire is also available locally and for the keen fisherman there are also fishing kayaks which can be used on the lochs. The Cottage is within easy walking distance of the Standing Stones and there are many spectacular views to appreciate as you walk. There are plenty tourist attractions in Lewis all easily accessible from Callanish such as the Doune Broch, the Garenin Black House Village, the Harris Tweed making display at Carloway and the Whale Bone Arch at Bragar to name but a few of the sights. The town of Stornoway is the Hub of the Island and just a 20 minute drive away and has its own collection of interesting shops.There is plenty to see and do in Lewis and indeed you may need a return visit to appreciate all the island has to offer. Relax and watch the sunset in the evening sitting on the decking looking over Callanish. Relax and watch the sunset in the evening sitting on the decking looking over Callanish. The kitchen is well equipped with everything you need for catering during your holiday The famous Callanish Standing Stones within sight and easy walking distance from the cottage and visible Callanish Standing Stones View from near the Standing Stones view from the cottage across the loch to the village of Linshader Relax in the comfort of the lounge or alternatively open the patio doors on to the patio and use the garden furniture provided Electric heating so you don't have to worry about a fire when you come home at night. 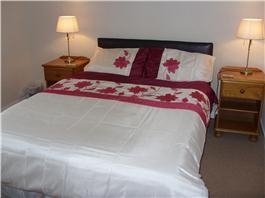 A comfortable and spacious double room with pine bedside cabinets dressing table and wardrobe View from the cottage. 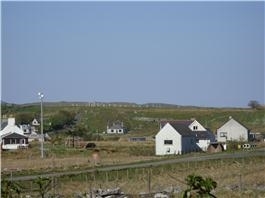 The famous Callanish Standing stones can be clearly seen at the top of the hill in this picture View from the cottage looking on to part of Callanish One of two single rooms in the cottage both spacious and furnished with pine furniture Dalmore Beach which is around 6 miles away on a dark winters day. Beautiful in the summer time with an expanse of white sand.